The carrier will operate once-daily round-trip service on eight of the new routes and Saturday-only service on the ninth. Southwest Airlines will also increase the frequency of its flights on four existing routes from Dallas Love Field in April. Spirit Airlines plans to launch service from Houston Bush Intercontinental Airport to 10 new destinations in the spring of 2015, three of them in the U.S. and the rest in Mexico and Central America. New U.S. destinations are the Tampa, Baltimore/Washington International and Oakland airports. Southwest Airlines will expand its fledgling international-service network by offering new flights to both the Pacific and Caribbean coasts of Mexico from August 10 and early October, as well as launching other new international services. Southwest Airlines subsidiary AirTran Airways is launching new international service within the next 10 days from San Antonio, Austin, Orange County in California and Chicago Midway, as well as new service between Fort Lauderdale/Hollywood and San Juan, Puerto Rico. Boasting 128 guestrooms, the Fairfield Inn Los Cabos is Marriott International’s first property in Los Cabos and is located on Lazaro Cardenas, the principal avenue of Cabo San Lucas. Southwest Airlines and its wholly owned subsidiary AirTran Airways have received route authority from the U.S. Department of Transportation for AirTran to operate international flights to new destinations in Mexico. The Ritz-Carlton Hotel Company, L.L.C. 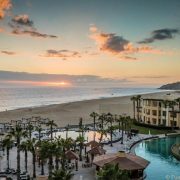 is teaming with a joint venture between Grupo Questro and Trinity Investments L.L.C.to develop a Ritz-Carlton Reserve in San Jose del Cabo in Mexico. It will open in 2014. Virgin America has launched its first commercial service to Mexico, the flight linking San Francisco International Airport with San Jose del Cabo International Airport, which serves the resort area of Los Cabos. Volaris is now offering twice-daily round-trips between Benito Juarez International Airport and Cancún and daily round-trips between México City and Guadalajara, Chihuahua, La Paz, Los Cabos and Mérida.